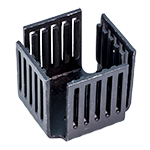 Slotted component cylinder heatsink. Chromate plated. Keyhole slot to grip component. 11/16"D x 1-1/2"L. Center inside diameter = 0.161". Heavy copper heatsink. Nickel plated. 2 - #8 threads @ 5/16" c-c on short base leg, 2 - #8 threads on back. Weighs 1/4 lbs. Made for HP-A4 FET. 1.5"W x 2.375"H x 0.5" deep. Snazzy Augat TO-3 transistor heatsink with hardware. 1.84" x 1.84" x 1.25" high. NSN: 5961-00-948-9249. Corrugated aluminum heatsink. Thin, flexible. 1-5/8" wide x 4" x 3/8" high. 0.013" thick. NSN: 5999-01-192-3185. Thermalloy heatsink. TO-220. Tinned copper. 1" x 1/2" x 1-1/8" high. 0.075" thick. NSN: 5999-01-157-4708. THM heatsink. Vertical mount, wave-solderable pins. Anodized black aluminum. 2-1/2" high x 1-5/8" wide x 1" long. For TO-202, TO-220. THM heatsink. Vertical mount, solder pins to anchor. Black anodized. 5/8"W open channel for component. 1-3/8"w x 1-1/2"H.
Thermalloy heatsink. PC mount. Single hole for tab transistor. 1-5/8" x 1" x 2"H. 1" c-c mounting centers on stake pins. Thermalloy heatsink. Slot accomodates most tab transistors. 1" x 1-3/16" x 1/2". EG&G Wakefield Engineering aluminum heatsink. Black finish. 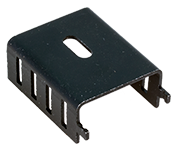 1" x 3/4" x 5/16"H. Fits TO-218, TO-202, TO-220. THM heatsink. Clips for vertical / horizontal mount. Black aluminum. TO-202, TO-220 case. 2" high x 2" wide x 5/16" long. Thermalloy heatsink. Black aluminum finish. 1/2" x 1" x 1-1/8"H. Fits most tab transistors. Thermalloy heatsink. Black aluminum finish. Vertical mount. TO-220 heatsink, no hole, with heatsink latch. 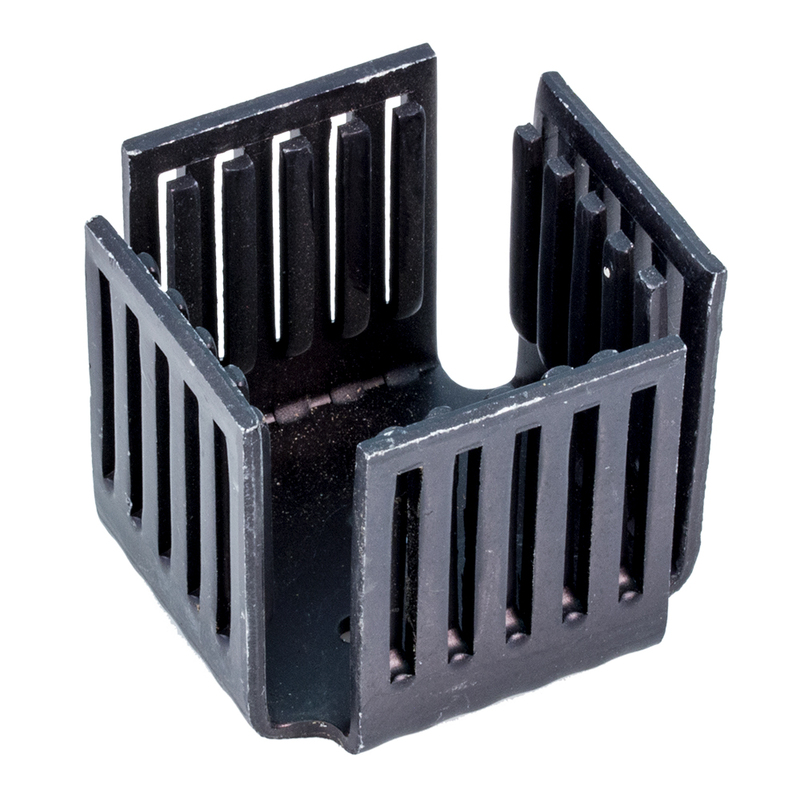 1/2" x 1" x 1-1/8"H.
Black, anodized aluminum heatsink. Extruded for H.D. applications. TO-202 case style. 2.000" HT. 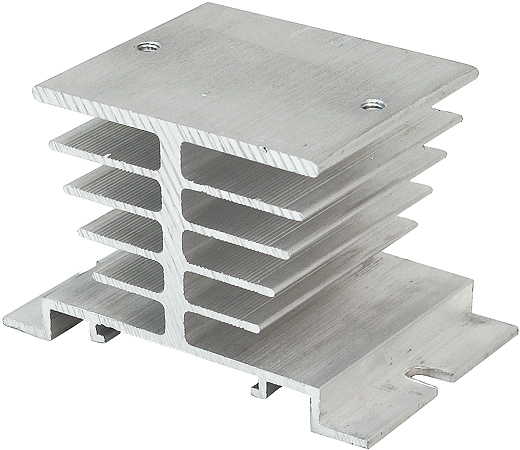 2-1/16" x 1-3/8" x 9/16"H.
Aluminum I/P rectifier heatsink. Dimensions: 3-17/32" x 2-1/8" x 9/16". Bare aluminum "U" heatsink. 1.375" x 1.91" x 1.22" high. Two 0.17" holes, 0.33" from each end. Bare aluminum "U" heatsink. 1.71" x 1.9" x 1.45" high. Two 0.17" holes, 0.33" from each end. Nestles inside of "B" and on top of TO-220 transistor, for sandwich effect. 1/2" x 3/4" long, 1/2" high. Permag beryllium ceramic heatsink washer. 0.810"OD, 0.086"H, 0.266"ID. WARNING - use caution when handling. NSN: 5999-00-986-1982. Thermalloy two-piece TO-5 heatsink. 0.815" outside diameter, 0.305" high. Thermalloy two-piece TO-5 heatsink. 5/8" diameter x 3/8" high. TO-220 transistor heatsink for PC mount. Thermalloy heatsink. TO-18. Screw NOT included. Alt. P/N: 352-9984-010. EG & G heatsink. TO-18. Insulated cup. 2 - 56 threaded base. Collins P/N: 352-9555-060. Mil-spec heatsink. TO-5. Insulated base. 4 - 40 stud. 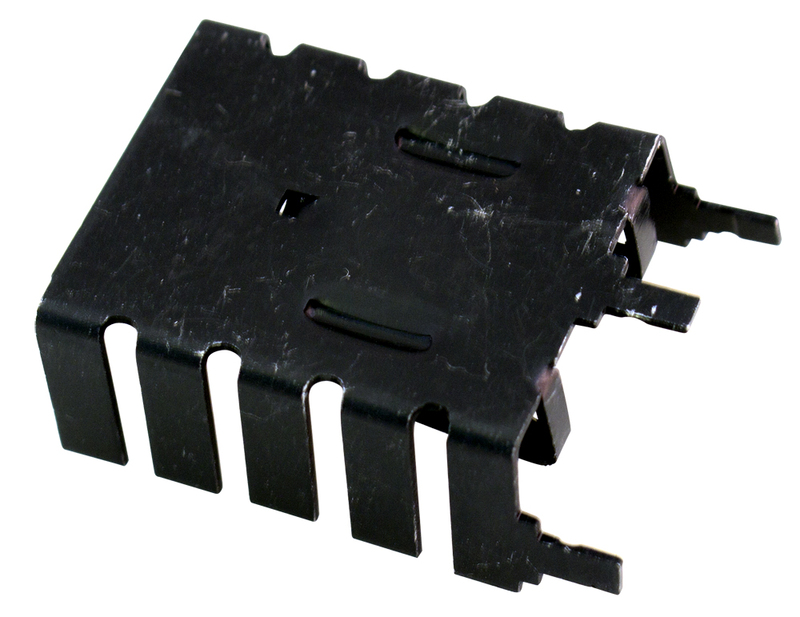 IERC non-insulated fits TO-5 transistor. Stud post. Mfg. P/N: TXB2P-032-037-3B or equal. 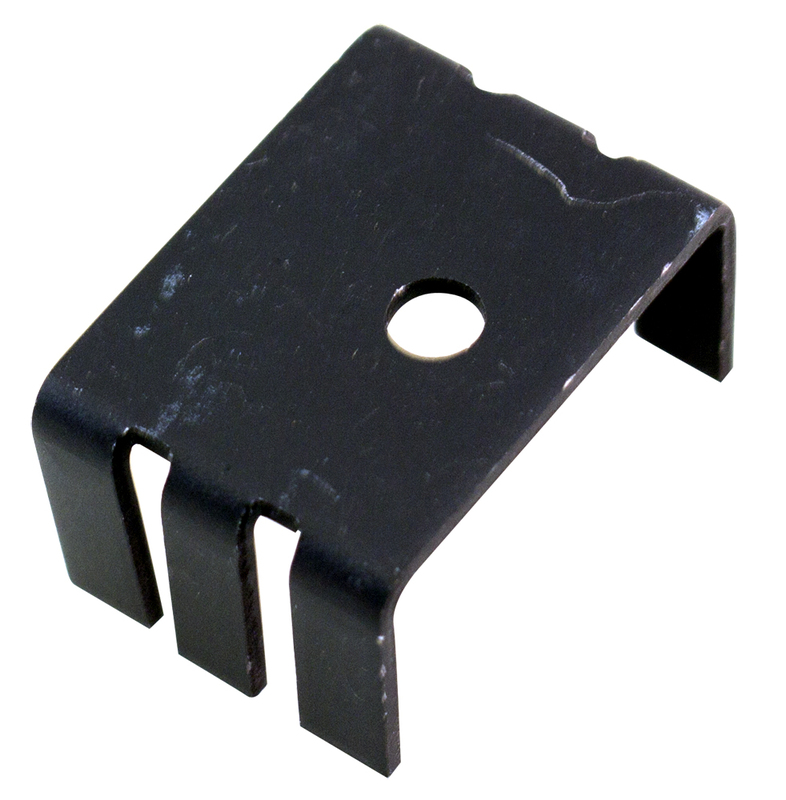 Semi-conductor retainer (spring clip). Cadmium plated copper alloy. Fits TO-5. 1/4"H x 3/8"D. Includes insulating washer. Heatsink for single TO-3. Heavy duty. 1-3/4" x 1-3/4" x 1-1/4". 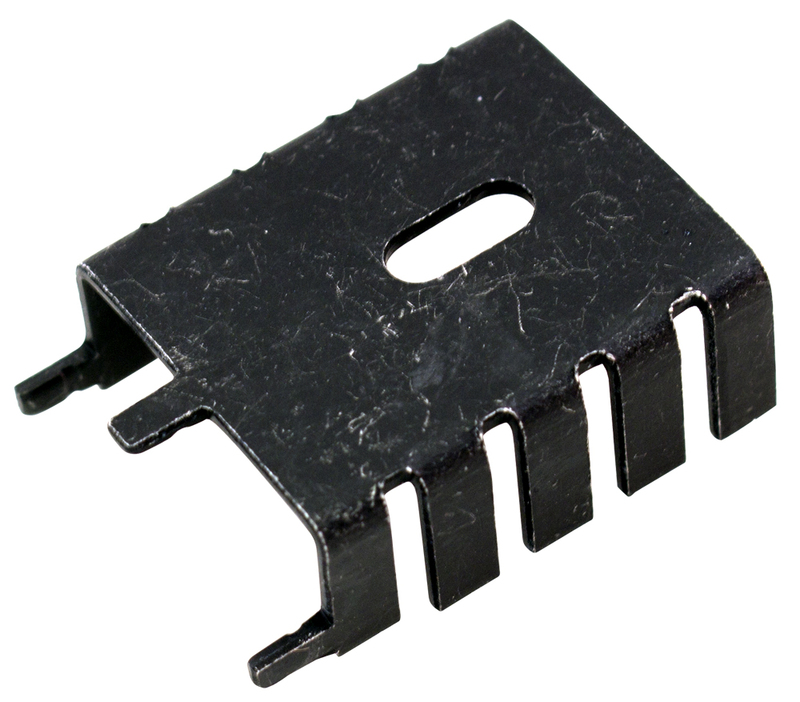 IERC single TO-3 transistor heatsink. 1-3/4" x 1-3/4" x 1" high. Aluminum heatsink. 1-1/4"D x 1"H. 1/4" threaded through hole. NSN: 5999-01-133-6728. Aluminum heatsink for (KO) SSR-25DA solid state relay. 1.96"W x 2.35"D with 2 M4 threaded mount holes 1.88" c-c on top mount plate for relay. 1.96" high. 1.96"W x 3.14"D base with two open 0.2" wide mount holes 2.7" c-c. 3.3 oz. TO-220 bare aluminum heatsink. 0.75"L x 0.6"W x 0.5"H.
1-7/8" x 1-7/8" x 1" high. Pre-drilled holes for single TO-3 transistor. Single transistor aluminum heatsink. Single TO-66 / TO-92 pre-drilled holes. 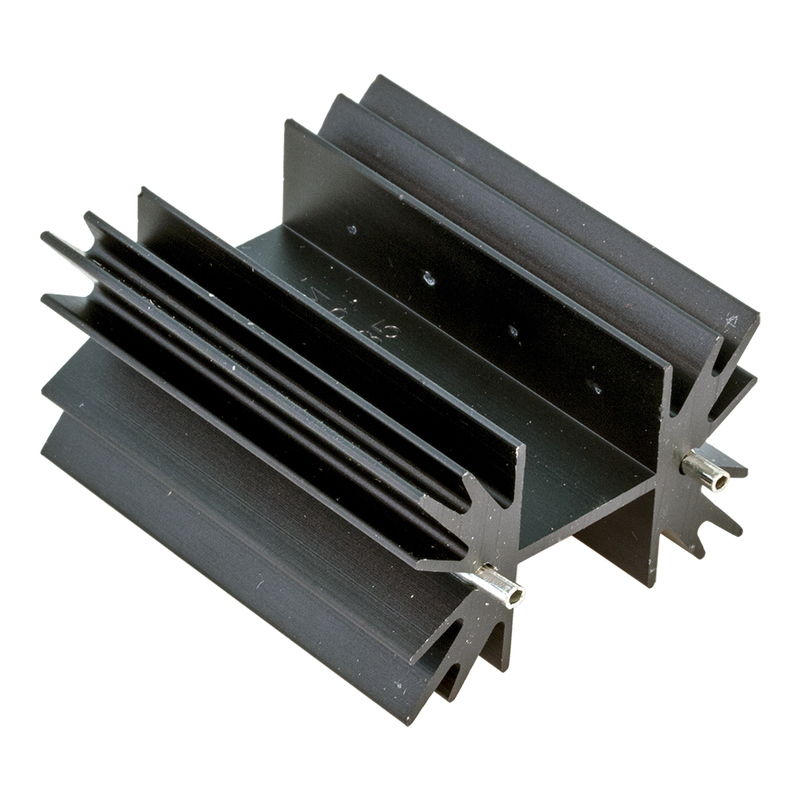 1-3/4" x 1-3/4" x 1-1/2"H.
6 hole heatsink. 1.147" x 2.33" x 0.5" high. 0.765" c-c larger end holes. 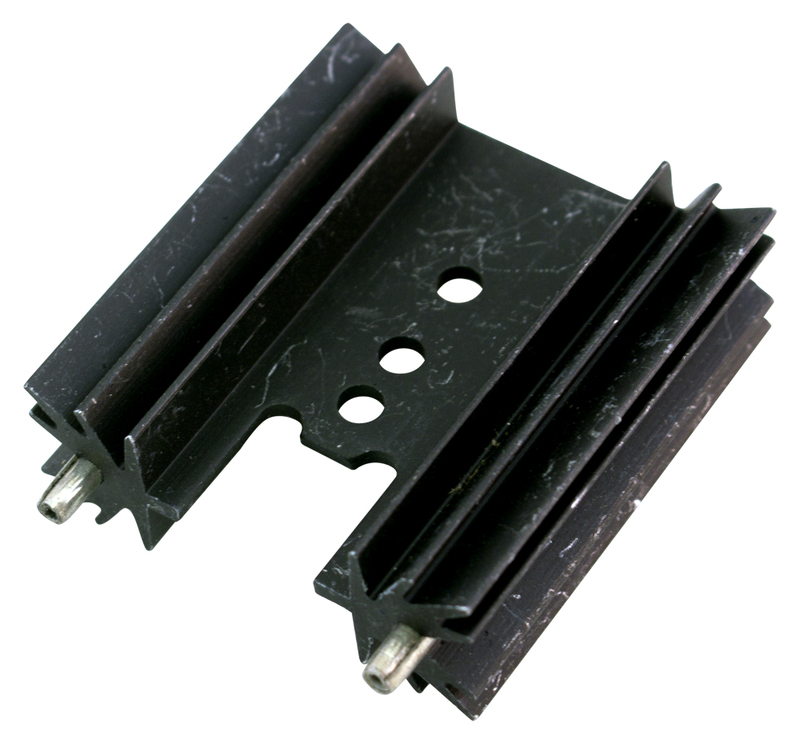 EG & G Wakefield heatsink for dual stud-mount semi-conductors. 37ºC @ 15w natural convection. 1.3º c/w @ 250 LFM forced convection. Black aluminum. 10 fins. 2" x 2" x 3". Threaded thru-hole: 1/4-28 UNF. IERC aluminum heatsink. 20 fins. Military black. 3 TO-66 transistors. 3-1/8" x 3-1/8" x 1"H. NSN: 5999-00-758-7276. IERC aluminum heatsink. Anodized black. 4 watts. Made for (2 each) TO-127 or TO-220. 3" x 3" x 1" high. Aluminum heatsink. Black. 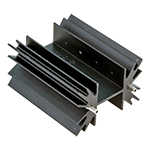 1-3/4" x 3/4" x 0.45"H. Hole configuration: 0.095"D - 0.335"D - 0.095"D, 0.365" c-c.
Thermalloy heatsink for single TO-3. 1-7/16" x 1-7/8" x 1/2" high. Black aluminum spring heatsink. 0.7" outside diameter, 0.197" high. 0.243" thru-hole. NSN: 5999-00-408-3931. Wakefield Engineering heatsink. Fits TO-5. Aluminum heatsink. 1/8"D hole. 1/2" x 1" x 1/2" high. NSN: 5999-01-005-4198. Cobra Industries heatsink. 2 piece, black aluminum. TO-3. Includes thermalloy THM6103. 1-1/2" x 1-1/2" x 1/2"H. NSN: 5999-01-069-7262. Split aluminum top hat TO-5 heatsink. 3/4" outside diameter, 0.21" inner diameter. 2 fins. NSN: 5999-01-022-9191.